A long-standing regional newspaper which began life as a daily title in 1895 is set to be closed by publisher Trinity Mirror later this month. The Nuneaton Tribune will publish its final edition on 24 September, just over a year after it slashed its distribution and launched a new pick-up model. The free weekly previously had a circulation of nearly 35,000 but last September cut this to 15,000 with the title available for pick-up at 99 retail outlets across North Warwickshire, Leicestershire and the West Midlands. Trinity Mirror said there would be “no impact” on staff as a result of the closure but has not given any further details about this. An edition of the Tribune from last year. 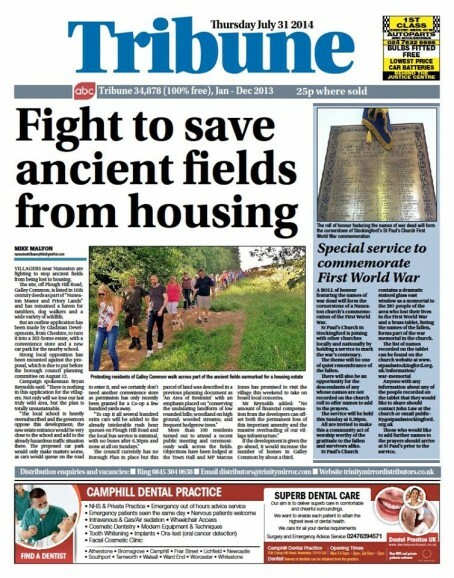 The Nuneaton Tribune is the town’s oldest surviving newspaper and competes with Local World’s Nuneaton News. The Warwickshire town is one of the few areas of the country where both Local World and Trinity Mirror, who earlier this year were rumoured to be in merger talks, publish titles whose circulation areas overlap. The Tribune started life as a daily called the People’s Tribune in 1895 and went from its paid-for evening status to a free weekly in 1992 following a newspaper “war” in the town which at one point saw three dailies competing for readers. When its distribution was changed last year, the title said the move would allow it to reach new readers and ensure everyone who wanted to receive the paper could do so. Confirming the closure of the title, a Trinity Mirror spokesman said: “The last edition will be published on Thursday 24 September. Whilst its never good to hear of a long standing paper closing ,with the current state of newspaper sales and the massive decline in readership figures as evidenced by the onging and most recent ABC figures ,its a bold but sadly necccesary move and one which other regional press groups need to consider. The good thing to hear is that no jobs are at risk,i just wonder for how long and whether its more of a brief stay of execution. 41 years ago, my career as a journalist began on the Nuneaton Trib. This is a sad day. @johnnie – It sounds like you’ve swallowed the executives’ handbook. Too much talk of ‘products, viability, profitability, plug-pulling and market places’ for my taste. these are basic terms used in everyday life nowadays and in media in particular , living in the past and old thinking is part of the reason regionals are in the state they’re in. The message @johnnie is making is valid no matter what terms are used. Sadly, I think we’ll see a steady trickle of stories like this one in the coming months/years. It sounds like the Nuneaton Trib’s time was up after a period of general decline. To my knowledge the only person working on this took voluntary redundancy some months ago. What a wise decision this has turned out to be. Very sad to hear this news, especially after its sister paper the Coventry Times was scrapped recently. Sad to hear, but I fear more from all companies. My old JP paper, started in the 1800s, has been turned in a few years from a thriving well-connected decently written weekly to a struggling user-generated shell cobbled together in a (non) news hub about 20 miles away, and now selling a pathetic quarter of what it once sold. And believe me, it wasn’t the internet wot did it! This story and the comments made on it sum the whole industry now. Project five years into the future and what will we have? Whatever it is we’ll all be moaning on Hold The Front Listicle about it from the workhouse internet café. When Trinity cuts titles like this – or any newspaper group – instead of axing it, they should invite communities to take it on themselves, along the lines of the community pub model. It’s morally wrong that a century old title should be sent to the dogs like this. No effect on staff? Possibly because the staff numbers are so small that they will just be moved to fill other vacancies? Or they have been run down to such small numbers as the circulation has dropped. It’s a credible suggestion @oor wulli but in today’s world what chance has a publication such as this in an era that’s seen how people access news change beyond all recognition away from the printed paper and move to Instant on line mediums instead,so the real issue is with people’s changed buying habits probably not the paper itself. There are not many groups or individuals without a charitable benefactor who could afford the set up and running costs to finance such a venture so sometimes we have to accept the inevitable. In many ways you have to give credit to them for pulling the plug on an unprofitable publication rather than risk financial problems by propping it up like so many regional press companies such as Archant are doing with their four ailing Norfolk and Suffolk dailies dailies. Perfect opportunity for an independent publication, rooted in the community, to set up! What world do some of the commenters on this site live in? Let ‘the community’ take it over? Why would anyone want to when they can set up a hyperlocal blog that doesn’t cost anything to print, can carry advertising and have multiple contributors running different sections without the need for premises, ad reps, designers, receptionists, newsprint costs, distribution costs… Need I go on? Why would the community shackle itself to a dying medium that costs a packet to operate, and is clearly unwanted? Because people still like having pieces of paper in their hands.